I wonder why, but most hosts do not pay much attention to teetotallers when it comes to planning the drinks menu! While the table is loaded with martini, vodka and wine, the teetotaller is offered the same flavoured soda and aerated water again! Oh, come on. Surely they deserve better than that! From this seed of a thought sprouted “Party Drinks”, a book dedicated to mocktails or smooth blends of non-alcoholic beverages like fresh fruit juices, syrups, cream, herbs and spices. You don't need any sophisticated equipment or exotic ingredients to churn out an exotic mocktail. All you need is a lot of innovativeness to produce some unusual, delicious blends. Thus, the repertoire of mocktails is limited only by your own creativity. Unleash it, and indulge! From amongst the vast possibilities, I have presented in this book a selection of recipes that are representative of the common types of mocktails, such as Coolers (like Guava Spritzer and Shirley Temple), Shake and Serve (like Red Apple Sunset and Virgin Pinacolada), Health Drinks (like Melon Medley), Frozen drinks (like Kiwi Margarita), Shots (like Spiked Beetroot), Punches (like Tea Sangria) and Muddle Drinks (like Watermelon Mojito). 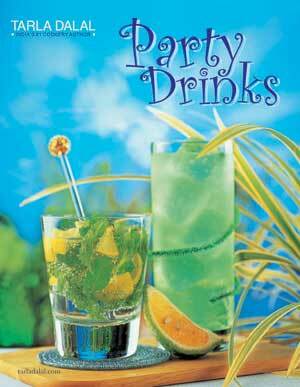 Let us explore the world of mocktails, which is limited only by the collective imagination of the human mind! As we delve more into the magic of mocktails, we will realise there is more reason to envy the teetotaller than mock his innocence!